Hello and welcome to another Digital Tuesday Challenge. This week's challenge is 'Animal Friends': simply make a card or project with animals on it and be sure to include at least one digital element. Our sponsor this week is 2 Cute Rubber Stamps and they are giving away 2 cling cushion rubber stamps or 3 digis to one lucky randomly chosen winner. To make my card, I used 2 Cute Rubber Stamps image 'Butterfly Bear'. My sketch is by Verve, and the paper is Cosmo Cricket 'Pixie-licious'. The bear was printed twice and popped up on dimensionals. I put Stickles on the butterflies and in the center of each flower. Here's a close up so you can see the dimension, image, and coloring better. Hello! I hope everyone is enjoying their Memorial Day Weekend. I had to work Friday and Saturday, but I have today and tomorrow off so I will be getting out and working in the garden. I know it's not a 'fun' activity to most, but considering how rarely I have time to play in my own garden, it's 'fun' to me. Today I have my last post as a Doodle Pantry Guest Designer. But it certainly won't be the last Doodle Pantry post you see from me, because I love their images and plan to make lots of cards with them throughout the summer. The picture belows shows a card made with a new Doodle Pantry image called "Noah's Ark" and designer digital paper called 'Baby Basics'. I also made a party favor made with a Doodle Pantry Template. I know I got the sketch for the card from somewhere, but I didn't write it down and now I can't remember it. Sorry. The image is available either in black or white or pre-colored, I chose to use the pre-colored version because I didn't think I could color it this beautifully myself. I embossed the white panel with the Cuttlebug Swiss Dots Embossing Folder, and put the Doodle Pantry 'Baby Basics' designer paper in strips up on top. The heart is a foam heart from the dollar bins at JoAnn's Fabrics and Crafts. The set comes with several great sentiments, I chose to use 'God's promises are forever' because rainbows are God's promise to us that He will never flood the earth again. I always think of that every time I see a rainbow. The party favor was very easy to understand and construct; just be sure to use double sided designer paper. Mine is from Stampin Up! and is called 'So Saffron'. I'm sure it's retired by now. I added a simple bow and flower for embellishment. You can fill the boat with candy and use as a party favor. I think it would be neat tied to a baby present as well. Here's a picture of just the card so you can see the image better. Well I think my blogger saga has finally come to an end. After 4 days of being unable to leave comments, I finally just clicked the 'create a Google Account' line and just re-submitted all my information all over again, and low and behold I could leave comments again! It makes no sense, because I could still access and post on my own blog and all my DT blogs, that information wasn't lost, yet I couldn't leave comments on other people's blogs because THE SAME EXACT INFORMATION was lost. Weird. Computers. Can't live with them or without them. First of all, does anyone know what is happening in blog land this time? I can't seem to leave a comment on anyone's blog which has google access. I've only heard of one other person having the same problem so far. It's so odd. I don't even know who to contact to resolve the issue. It started yesterday, and I thought it would just be resolved today, but it isn't. The first three cards all use images from the JustRite set 'Christmas Ornaments'. The paper is Basic Grey 'Jovial Paper Pad'. The ornament and main circle panel are up on dimensionals. I put Gold Liquid Pearls on each scallop. The sentiment is embossed with a sparkly gold embossing powder. For this card, I used an old Midnight Madness Sketch (MMSC74). The paper is Basic Grey 'Eskimo Kisses'. The ornament and the sentiment are up on dimensionals and there is a silver adhesive sticker in the center of each snowflake. This card uses paper from Cosmo Cricket 'Mitten Weather', and the sketch is JUGS18. The sentiment and the ornament are up on dimensionals. And finally, my last Wink Wink Ink card you will see for awhile. Melanie, the owner of Wink Wink Ink has temporarily closed her store due to some personal issues that need to be taken care of. Hopefully, she'll re-open her store again soon. This card uses the image 'Season's Tweetings'. The paper is Cosmo Cricket 'Jolly by Golly'. The main image is mounted up on dimensionals. The snowflakes are felt cut outs from JoAnn's Fabrics and Crafts. Hello, and welcome to another Digital Tuesday Challenge. This week's challenge is hosted by ME! I picked 'Add Texture to your cards and projects' for our weekly theme. Simply add texture with embossing powders, embossing folders, material, ribbon: anything goes. And be sure to use at least one digital element on your card. Our sponsor this week is The Stamping Boutique and they are giving away five digis to one lucky randomly chosen. To make my card, I used The Stamping Boutique image 'Max'. I added tons of texture on this card: I used several different embossing folders, all on Coordinations Cardstock which was then sanded to create more texture and highlights. Then the sentiment is embossed with a sparkly black embossing powder, twill tape was added for material texture, brads for a metal texture, and glitter glue for a scratchy texture. Here is a close up of the main image. You can see the Glitter Glue highlights better also. Hello! This month the Hotspot Challenge is to 'Case a Cake'. It's an inspiration challenge. 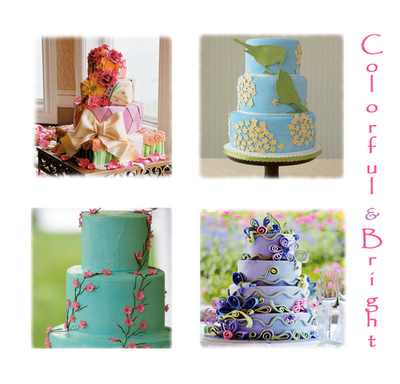 Shawne has lots of beautiful pictures of cakes on the Hotspot Blog, all you have to do is pick one, and create a card or projects that has something on it that inspired you from the cake. First, here is my card. 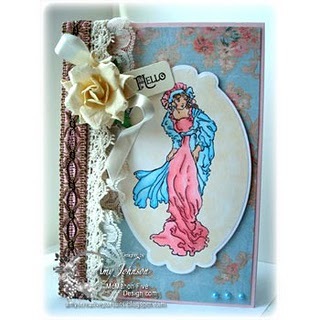 I used a sketch by Verve, and paper from Prima 'Melody'. I printed the image twice, and mounted up just the flowers and the Hummingbird on dimensionals. I put yellow flocking in the center of each flower. The main image panel is also mounted up on dimensionals. The image is one of Shawne's digital images from Studio 313 called "Hummingbird". And here is the cake I was inspired by: It's in the lower left corner. I was inspired by the beautiful teal color and the elegant pink flowers. Here is a close up so you can see the dimension, coloring, and flocking better. You have 10 days left to play, so what are you waiting for? Get going! You could win $25.00 worth of digis from the McMahon Five Designs Store! This year I'm going to try really hard to photograph my garden throughout the season, and write posts about all the new blooms. I've already shown you my daffodil post HERE, now most of my daffodils are gone with the exception of a few stragglers, but the Creeping Phlox, Flowering Crab apple Trees, and Lilacs are in full bloom and my yard looks and SMELLS like heaven! This is my favorite time of year, when everything is clean and new, and the air is intoxicated with perfumes. 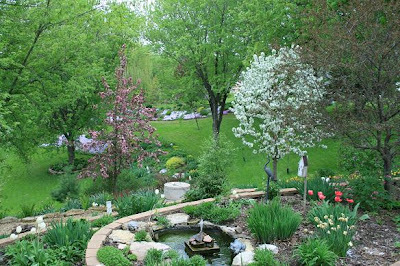 This first picture shows a view of my yard from my front porch. My yard is HUGE. This is just the west side. The small pond is right in front of my porch. I can hear the sound of the fountain in my kitchen window and upstairs bath, and it's perfect for greeting visitors. This is an old 'butterfly house'. I've never seen any butterflies use it. The tulips are fading already, but the Bleeding Hearts are just starting. 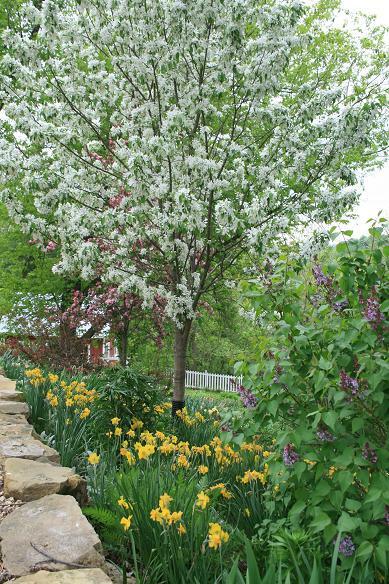 This white flowering crab apple is just GORGEOUS right now. It takes my breath away every time I look at it. I have 4 flowering Crab apples in my yard. They are my favorite trees! 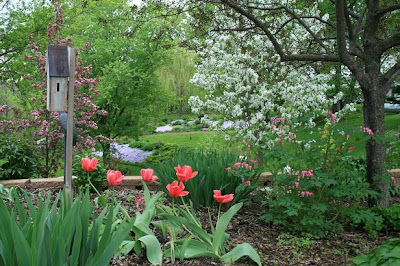 They provide year long interest: Flowers in the spring, purple foliage in the summer, and red crab apples to feed the birds in the winter. They all bloom at different times too. Just when one is done blooming, another one starts. 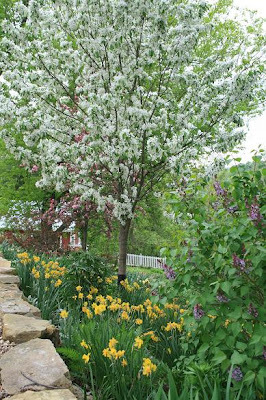 Those are some late blooming daffodils below the tree, and a small lilac bush in front of it. This is a path down to the south porch of my house. It's the same path the guests walked to my daughter's wedding last year. 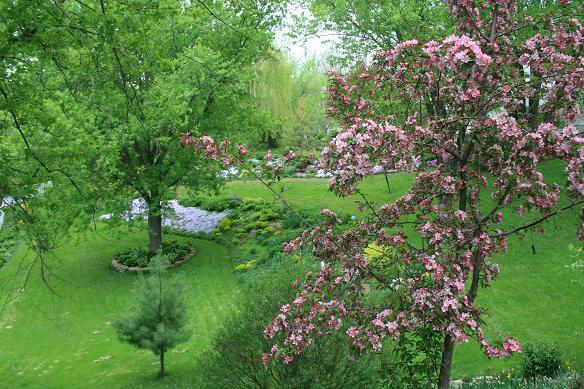 Here is my pink flowering crab apple. It's not in full bloom yet, it's just starting to blossom. In the background you can see my creeping phlox. 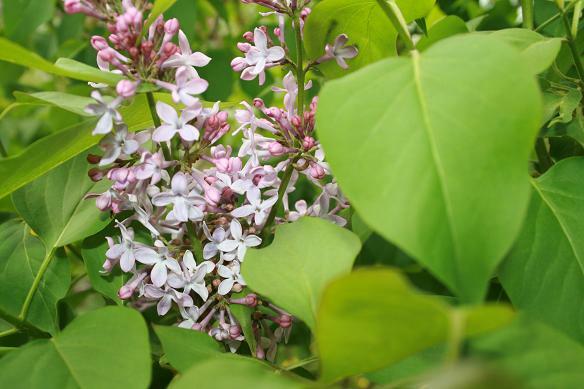 A close up of a lilac. Oh, how I love the scent of lilacs! 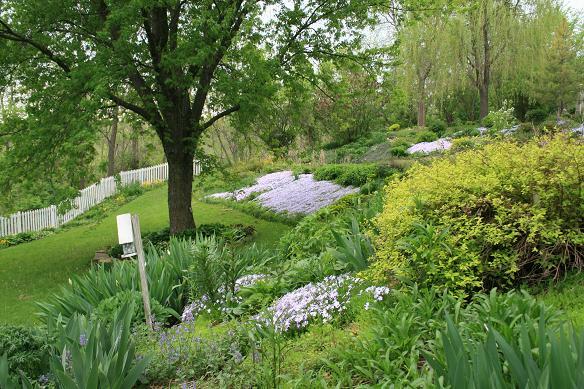 Here is a close up of the hill where my creeping phlox blooms. It's actually my septic mound. LOL! And finally, some little baby robins! My yard is a virtual habitat for birds! I have every possible bird you can imagine in my yard. They love living here. There are bird nests everywhere! Their favorite place to nest is my hanging baskets. I have about 16 hanging baskets around my yard, and I currently have bird nests in two of them. It sure makes watering them hard! 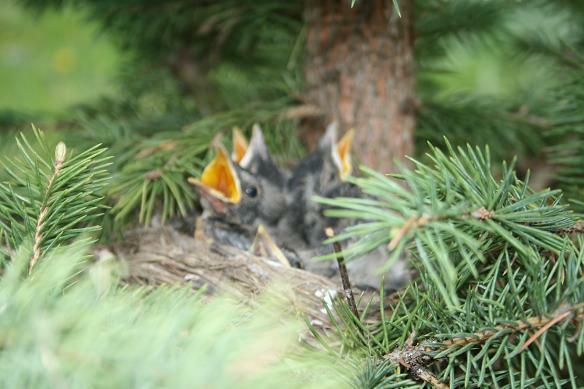 As soon as I came close to the nest, the baby birds opened their mouths wide thinking I was their mother coming to feed them. Mom was not far off, watching me with worry as I took pictures of her babies. She didn't like that at all! Hello! Today I have a masculine card for you that using a image from McMahon Vintage Digitals called 'Crane'. This image is perfect for masculine birthday cards and Father's Day! 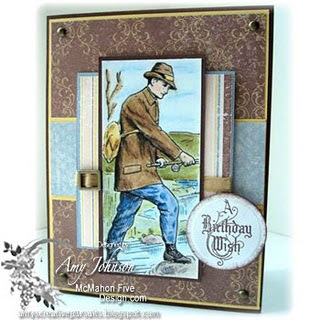 Because my card is for a male birthday, I kept the layout very simple and included some rugged hardware from Stampin Up!. The image is colored with Prismacolored Pencils and Gamol. The papers are retired Stampin Up! 'Parisian Breeze'. Be sure to check out the McMahon Five Designs Blog to see the rest of this week's new releases. And also check out my fellow design team members blogs as well, they are listed in my sidebar. On a side note, McMahon Five Designs is looking for new designers. If your interested, see this POST. Hello and welcome to another Digital Tuesday Challenge. This week's challenge is 'Seeing Stars'. Simply make a card or project that has stars on it! Our sponsor this week is Doodle Pantry, who I am also a Guest Designer for this month, so I was thrilled to see our sponsor! Doodle Pantry is giving away a $10.00 gift certificate to one lucky randomly chosen winner. 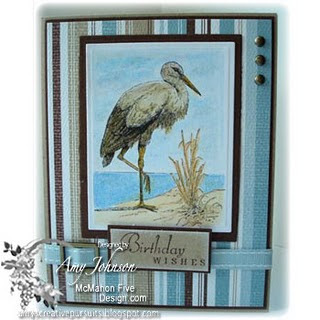 To make my card, I used the new Doodle Pantry image set 'Super Birdie'. This set comes with 3 different designer papers, several sentiments, and in black and white or pre-colored. I chose to use the black and white version and color the image myself. My layout is by Verve. The main image panel, sentiment tag, and the birdie are mounted up on dimensionals. The stars are from the Dollar Bins at JoAnn's Fabrics and Crafts. They are self-adhesive foam. And all the designer paper is from the digi set. Isn't it cute? The image was colored with Copic Markers. Here's a close up so you can see the coloring and the dimension. Be sure to check out the McMahon Five Designs Blog to see the rest of this week's new releases. And while your at it, check out my fellow design team members blogs too! Their links are listed in my sidebar. 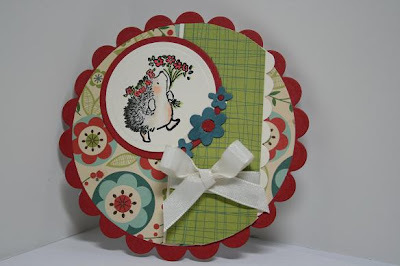 Today I have my second card to show you as one of this month's Doodle Pantry Guest Designers. This card uses the newly released image 'Mud Piggy'. It comes with two digital papers (the stripe and the polka dot shown on my card), in-color and in black and white, and with several fun sentiments. To make my card, I used a Sweet Sunday Sketch (SSC99), and I printed the image in black and white THREE times so I could pop the head up on dimensionals, and then I cut out just the snout and popped that up on dimensionals. The 'Sooey!' sentiment comes with the set, but the birthday sentiment is computer generated. Here's a close up so you can see the dimension better. This was such a fun set to play with. And I love it when digi images come with coordinating designer papers. It makes it so much easier to create a project that way. Hello and welcome to another Digital Tuesday Challenge. This week's challenge is called 'Thinking of You'. Simply make a card with the sentiment 'Thinking of You' on it and be sure to include at least one digital element. Our sponsor this week is MyGrafico and they are giving away a digi stamp set and 20% off an in-store order to one lucky randomly chosen winner. 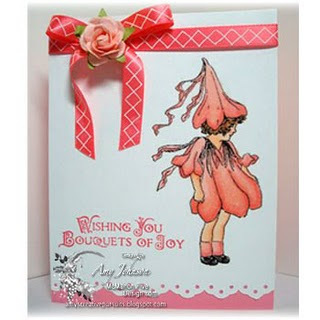 To make my card I used an image designed by Cheri Wenger called 'Sew Long Flowers' which is sold at MyGrafico. This is just the cutest digi set! It includes a large number of 'sewn flowers' and a couple of sewing sentiments. I chose to use the flower border on my card, but I cut the flowers up and glued them on my panel. The paper is by Cosmo Cricket and is called "Material Girl". It went perfect with the images. It might be hard to see in the photo, but the flower paper has little spools of thread and scissors on it, and the green panel is all little scissors. It's so cute. Because it's a 'sewing themed' card, I did lots of machine stitching all over the card. I did a straight stitch around the entire card base, zig zag stitches on the smaller panels, and a curvy stitch on the sentiment base. The sketch is by The Sweet Shop. Here's a close up for you: The sentiment is a freebie by Lindsay's Stamp Stuff called "Lovely Tickets". Spring has FINALLY arrived here in Northwestern Wisconsin, and I must say I am amazed at the amount of Daffodils I have blooming this year. They have really multiplied. This garden is HUGE. I planted these daffodils in groups probably about 8 years ago and divided them a couple of times and look at what they have multiplied into: If you have a hill in your yard, plant daffodils. They love hills because their bulbs don't rot or soak in water. Here is a side view of the hill overlooking my garden shed. This view is at the base of the hill looking up at my house. I'm amazed at how prolific the daffodils are this year considering all the horrible cold weather we've had and spring snowstorms. I literally did not think they'd survive being buried under a foot of snow once they had buds on them. But they did. Isn't Mother Nature amazing. And finally a far away shot of the whole hillside so you can see how large this garden is. 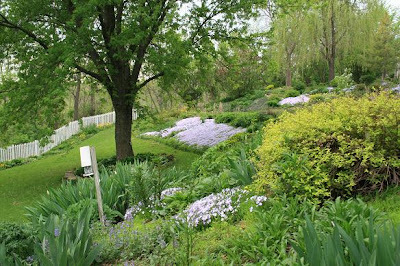 The rest of the summer this garden is covered in ground covers, and in the fall the entire hillside is filled with Black Eyed Susan's. All the spring birds have finally arrived. My favorite are the Orioles. I saw the finches turned yellow already. There was one bathing in my water fountain early this morning. Oh how I love Spring. It's my favorite time of the year. Now, if I could only spend the whole day outside and not have to go to work today! Darn. Hello Again! This is my second post for today, so if your looking for McMahon Five Designs New Releases, scroll down. Today is a very special day for me because I get to announce that I was asked to be a Guest Designer for the month of May for Doodle Pantry! I was so excited to receive the invite because I love their images, especially the ones with the little birdie because it reminds me so much of my own dearly departed pet bird "Norma Jean". The illustrations just capture her personality beautifully. Today's card however, features not a little bird image, but a "Little Frog". It comes in black and white and pre-colored, and also with some fun sentiments and designer paper. The frog is also available sitting on a leaf. I chose to use the black and white version of the frog sitting on a Lily Pad. I used both designer papers, and one sentiment. I printed the image twice, and cut out the lily pad and pad and popped it up on dimensionals. The main image panel is also up on dimensionals. Then I enlarged the image, printed it again, and this time cut out just a Water Lily and popped that up on dimensionals. The image was colored with Copic Markers. Doodle Pantry has lots of other really cute new releases this month! I'll be making something with each and every one all month long for you to enjoy! But in the meantime, be sure and check out the Doodle Pantry Blog to see all the rest of the new releases and the rest of the Design Team Members Creations. Hello and welcome to another Digital Tuesday Challenge. This week's challenge is 'Ribbon and Lace', simply use ribbon and lace and at least one digital element on your card or project. Our sponsor this week is Digital Delights and they are giving away 3 digis to one lucky randomly chosen winner. Hope it's warmer where you live! Here's a card I made awhile back for the April 'Stock the Pantry' challenge which use to be on the Crafter's Digital Art Center, but has since moved to the Doodle Pantry Blog. I posted it on CDAC, but couldn't fit a posting on my own blog until now. The challenge was simple: Just make a card with a Doodle Pantry Image. I used the 'Pirate Birdie' set, an 'I Love to Stamp' sketch, and paper from DCWV 'All About Boys' which works GREAT with this digital stamp set. The sky was colored with chalk and a stencil, and I used a Cuttlebug Embossing Folder called 'Mesh' for the background. Well I've been blessed all winter without ever getting sick once; which is really amazing since I work in retail and I am constantly exposed to all sorts of germs. But now I've come down with a terrible, terrible cold. I have total laryngitis. I was suppose to sing on my worship team at church this morning, but obviously that didn't happen. It's such a weird feeling when you open your mouth to sing and nothing comes out but air. I haven't been able to sing for about 4 days now, and you what? I miss it! It's awful not being able to sing. I was driving to work (yes, I'm still going to work and grossing all the customers out. In retail, you always have to find someone to take your shift and since I usually start at 6:00 or 7:00 a.m., I just can't bear myself to pick up the phone and start calling people at 4:00 or 5:00 a.m. LOL!) and felt so inspired to harmonize with a worship song, but no words would come out. It's so depressing. I hate being sick. Hopefully my misery will end soon, in the meantime, off to work I go.